One of cleo's chicks being a dumpling in the gate entrance. Such a cutie! 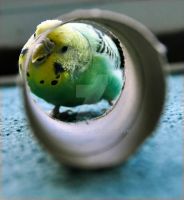 Really cute bird! I'd like to use this picture for a drawing reference! Hey now hey now maybe she's just pleasantly plump! 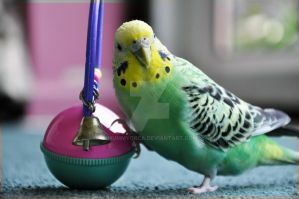 My gosh, I recently got given a budgie that looks almost the same as this one. She's a little lighter, but, still. Her name is Zara. Looks like a little marshmallow peep! OMG. I had one of these babies just like that one! Grew up into a chubby almost equally adorable hen. What a lovely thing to have in your home.